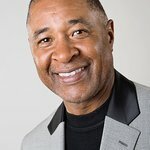 Former St. Louis Cardinals baseball superstars and World Series champion teammates Ozzie Smith and Vince Coleman joined forces to once again win a title – this time on the golf course – at the 12th annual Michael Jordan Celebrity Invitational (MJCI) hosted by ARIA Resort & Casino. The tournament was held at Shadow Creek for the third consecutive year and was highlighted by the winning duo’s score of 11-under par, 133. More than $500,000 was raised for charity as a result of the 2013 event. Smith and Coleman, who each took home $20,000 for their designated charities, followed up their first-round score of six-under par 66 with a five-under par 67 on day two. They were able to overcome a late surge by the second-place team of Ahmad Rashad and the “Great One” Wayne Gretzky to win by four strokes. The two teams were tied heading into the 17th hole but Smith/Coleman birdied the final two holes while Rashad/Gretzky bogeyed their final two holes. Click here for MJCI Final Results. Defending champion Brandi Chastain and this year’s teammate Ken Griffey, Jr., shot a seven-under par 65 to take the lead after day one. However, the All-Star athletes struggled on Sunday and finished the 36-hole tournament at three-under, 141. Fan favorite, NBA legend and tournament host Michael Jordan teamed up with NFL Super Bowl champion and “sack master” Dwight Freeney to finish in a tie for ninth at Even par, 144. Bringing additional fun and laughter to the tournament, the multi-talented Will Smith lent his support to friend and tournament host Michael Jordan when he attended the gala celebration Friday night headlined by musical star John Legend and again Saturday for the first round of the celeb-only tournament. At Shadow Creek, Smith appeared on the first tee and was introduced by the announcer as “the guy who’d like to play the role of Michael Jordan ,” and the crowd roared. Hosted at Shadow Creek, MJCI marks only the third time the exclusive golf course has opened its doors to the public. Proceeds from the charitable tournament are benefitting the Make-A-Wish Foundation, James R. Jordan Foundation, Opportunity Village and Cats Care, the NBA’s Charlotte Bobcats’ charity arm. Since its inception in 2001, MJCI has raised more than $6 million for over 45 charities. MJCI celebrities in attendance included Michael Jordan, Flex Alexander, Marcus Allen, Anthony Anderson, Miles Austin, Brian Baumgartner, Jerome Bettis, Wayne Brady, Dez Bryant, Chevy Chase, Brandi Chastain, Don Cheadle, Chris Chelios, Roger Clemens, Vince Coleman, Michael Crabtree, Brian Cushing, Richard Dent, Kevin Dillon, Julius “Dr. J” Erving, Michael Finley, Josh Freeman, Dwight Freeney, Janet Jones-Gretzky, Wayne Gretzky, Ken Griffey Jr., Penny Hardaway, Ron Harper, April Holmes, Brett Hull, Dan Jansen, Brody Jenner, Bruce Jenner, Andre Johnson, Toni Kukoc, Mario Lemieux, Kenny Lofton, Greg Maddux, Chi McBride, Win McMurry, DeMarco Murray, Kevin Nealon, Hakeem Nicks, Jonathan Ogden, Paul O’Neill, Jake Owen, Patrick Peterson, Michael Phelps, Ahmad Rashad, Jerry Rice, Salli Richardson, Rob Riggle, Stuart Scott, Bruce Smith, Ozzie Smith, Will Smith, Jason Taylor, Alan Thicke, Andre Ward, Winky Wright, Adrian Young and others.